The onset of fall can be a time of mixed emotions for many of us gardeners. As trees and shrubs begin to clothe themselves in showy autumnal colors—burnished oranges, glowing reds, buttery yellows, overtones of bronze—our perennial borders take on a somewhat sad, lackluster appearance. Indeed, it's often the case that when the dog days of July arrive, a mild horticultural despair sets in and dissuades us from making any further trips to the nursery. If we do decide to go, it's usually to shop for the easy quick fix: mums! Typically, we'll buy legions of brightly colored chrysanthemums to camouflage the spots where faint-hearted perennials have keeled over or where annuals are just about spent. But there's an alternative to the chrysanthemum solution that provides, in my opinion, a happier denouement to our usual tales of gardening woe. Asters! Our hardy, sun-loving native asters cruise through the summer swelter and build to a crescendo of late-season blooms. What's more, their primarily blue-violet flower tones work in cool, subtle contrast to the fiery fall landscape at large. There are hundreds of species with the common name of aster. They were once considered part of the huge Aster genus, but North American species were reclassified into several other genera in the 1990's after research showed that they were not closely related to Eurasian species. All aster species belong, along with zinnias, dahlias, mums, and other daisy-faced beauties, to the Asteraceae, the largest of the flowering-plant families. Since wild asters generally grow to about 5 or 6 feet tall and have "weedy-looking" foliage, gardeners in the United States have been slow to embrace them. This is not the case in England and Germany, where breeders have been creating more compact and garden-friendly varieties since the 1890s. 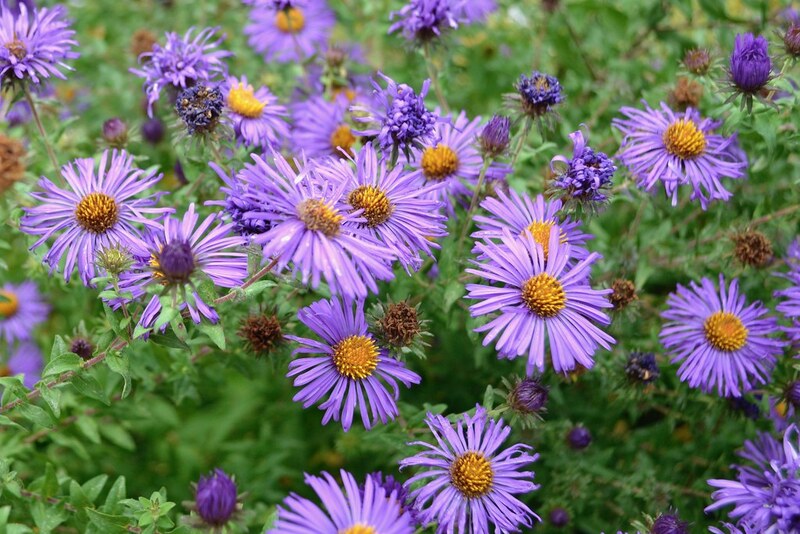 Let's begin with Symphyotrichum novae-angliae (zones 4 to 8), the wonderful New England aster. This classic wildflower of our open sunny spaces grows to five feet in height and bears violet-purple flowers with yellow centers from late summer to mid-autumn. Its strong stem makes it perfect for flower arrangements. The New England aster has furnished us with a wide variety of cultivars. Like the species plant, they all flourish in full sun and good garden loam. The taller selections, if you forget to pinch them, may need staking. 'Alma Potschke' grows between 3 and 4 feet tall, with bright rosy red flowers. If you're a timid soul, you might need sunglasses when you gaze at this hot aster. I have an affinity for short plants, so my favorite is 'Purple Dome'. It grows to between 18 and 24 inches tall and, come early fall, is absolutely drenched in vivid purple flowers. Many asters are prone to mildew and leaf diseases and can wind up, excuse the expression, "with bare bottoms." But 'Purple Dome' is so close to the ground that any damage it might sustain is unnoticeable. 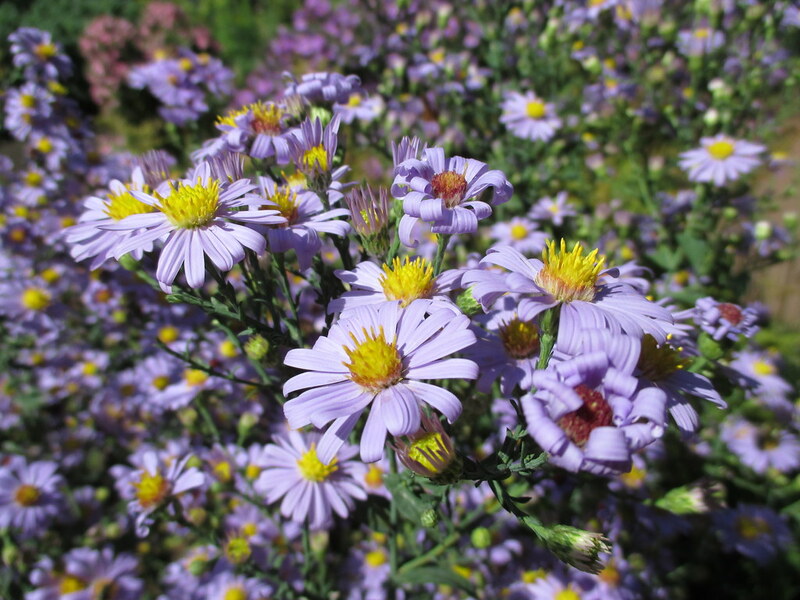 More: Beautiful native aster species growing at Brooklyn Botanic Garden. Symphyotrichum novi-belgii, the New York aster (zones 4 to 8), grows to four feet. Its stems are more slender than those of the New England aster, but it has similar flower color and cultivation needs. English gardeners refer to it as the Michaelmas daisy since it's always in bloom during the feast of Saint Michael (September 29th). Getrude Jekyll, the doyenne of perennial garden design, loved these flowers so much that she used them to compose an entire border. The New York aster's long list of cultivars includes 'Mount Everest', which grows to 3 feet and is covered in lovely white flowers for a few weeks. 'Lady-in-Blue' is a recent introduction, just 12 inches tall, with lovely medium-blue flowers. 'Nesthäkchen' is 18 inches tall and compact, with really striking pinkish red flowers—I'm fond of this one not only for its color but also its resistance to mildew. 'Professor Kippenberg' is an old-fashioned cultivar; at 12 inches, with attractive lavender semi-double flowers, it makes a definite statement for a short plant. The new Woods series offers 8-inch dwarf asters in pink, purple, and blue that are excellent for the front of the fall border. 'Royal Ruby' and 'Royal Velvet' are taller cultivars, growing to between 24 and 30 inches. They offer, respectively, a semi-double ruby color and a baronial violet-purple. Finally, another British-sounding cultivar is 'Winston Churchill'. It is only 2 to 3 inches tall with very deep red flowers. 'Bluebird', a cultivar of Symphyotrichum laeve, the smooth aster (zones 4 to 8), is a personal favorite of mine in the category of tall asters. Violet-blue yellow-centered flowers and attractive blue-green foliage make this 3-foot aster one of the highlights of my fall border. I like to combine 'Bluebird' with Solidago rugosa 'Fireworks', a lovely 3-foot compact goldenrod with great, arching sprays of golden flowers. A little-known aster is Symphyotrichum oblongifolius, which can tolerate a fairly dry environment. The 2-foot-tall cultivar 'Raydon's Favorite' flourishes in full sun and well-drained soil. Its blue-purple daisy flowers explode in early fall above fragrant foliage. 'Prince', a cultivar of Symphyotrichum lateriflorus or calico aster, like the pop star of the same name, dares to be different. At 3 feet tall, it has white daisy flowers with contrasting dark purple foliage. This foliage may turn green in very hot weather, but if given light shade in the afternoon can keep its unusual color. 'Prince' likes a moist, moderately fertile soil (zones 4 to 8). Ampelaster carolinianus), the climbing aster, flourishes from zones 6 to 9. Come springtime, it already looks rather tall and spindly. As the seasons progress, it can reach a height of up to 12 feet. Ampeleaster carolinianus prefers full sun and fertile soil, and produces arching stems with pink to purple flowers in October. It looks marvelous sprawling along a fence or trellis. 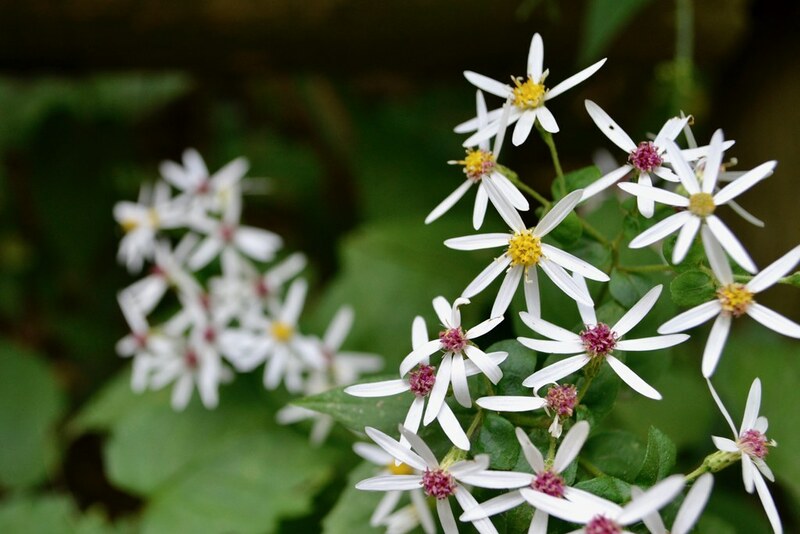 Eurybia divaricata, the white wood aster (zones 4 to 8), is perfect for the shade garden. It grows from 12 to 18 inches and, in August, produces tiny white daisies with yellow centers atop heart-shaped leaves. It works great in light shade with good air circulation, but prefers morning sun. The caveat is that, if it likes your garden, it will spread rapidly. So thin it out in spring if you'd like other things to grow as well. To take full advantage of the diversity of asters—short, medium, tall, and climbing—choose a worthwhile companion plant. I've already mentioned goldenrod. Try, too, one of the wonderful fall-blooming alliums, such as Allium virgunculae, whose pink star-shaped flower clusters appear in October. Another interesting combination plant is Amsonia hubrichtii (Arkansas amsonia), whose feathery green foliage turns a handsome buttery yellow come autumn. Some of the best partners for fall are the late great grasses like the Panicum species (switch grasses), whose autumnal colors echo those of the surrounding trees and shrubs. 'Heavy Metal' has metallic blue leaves that turn yellow to buff. Its airy plumes are off-white. The foliage of 'Haense Herms' turns scarlet in fall. 'Dallas Blue' also gets great fall color. Asters even make great companions for your chrysanthemums, if you find it too hard to let them go. Stephanie Cohen teaches at Temple University, Ambler and is founding director of the arboretum there. She is that author of The Perennial Gardener's Design Primer. I love asters. I keep asking my friend the name of this beautiful flower. I did not know there are so many kinds until reading this wonderful article. I have a hell strip that I am working on that has few asters now, but next year, that’s what I will plant—all kinds and colors! Thanks! Symphyotrichum novae-angliae (New England aster) flower heads. Photo by Blanca Begert. Symphyotrichum laeve 'Blue Bird' (smooth aster) in the Shakespeare Garden. Photo by Sarah Schmidt. Eurybia divaricata (white wood aster). Photo by Blanca Begert.